Planned Parenthood is America’s largest abortion chain, performing over three hundred thousand of them every year. Recently, it took on a new task: giving advice to pro-life Republicans. Beginning in July, the Center for Medical Progress (CMP) began releasing a series of undercover videos. Shot with hidden cameras, they show Planned Parenthood officials admitting to multiple crimes, including the sale of fetal body parts, performing partial-birth abortions, and illegally altering abortion techniques in order to harvest organs. CMP also uncovered evidence that Planned Parenthood is committing infanticide. In response, the House Judiciary Committee has announced that it’s about to hold hearings on Planned Parenthood’s activities. Two other committees are conducting investigations of their own. While public records show that Planned Parenthood generally helps Democratic candidates, it recently decided to bless Republican committee members with some free advice. Laguens is very kind to show this sort of concern, but she should probably review some facts before offering counsel. The first is that what’s on the video footage isn’t the result of any “campaign”; it’s the result of Planned Parenthood officials being willing to break the law. A lot. The second is that far from blocking access to health care, pro-lifers are fighting to expand it. Last month’s Senate bill to defund Planned Parenthood would have redirected it’s half billion dollar subsidy to community health centers, places where people of limited means can find the care they need. Further, community health centers offer services at far more locations than Planned Parenthood provides. Finally, hearing a lab assistant cheerfully note how there’s “another boy” lying dead on a countertop is more the sort of thing that turns off voters, especially when they learn that their tax dollars helped put him there. 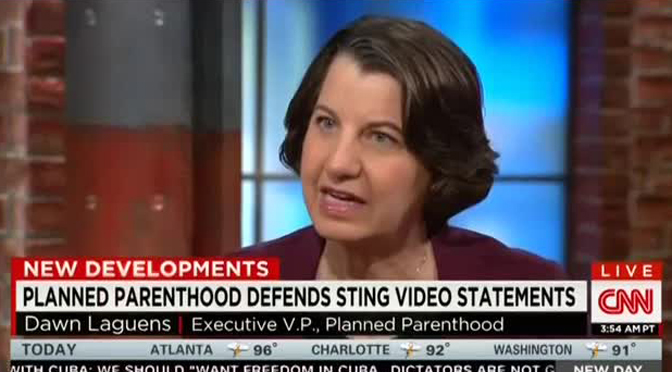 Contrary to what Dawn Laguens says, investigating Planned Parenthood is a great move. Defunding it would be another one, which is why Live Action has a petition asking Congress to do so. Meanwhile, Planned Parenthood should really stop worrying about pro-life lawmakers and focus on their own problems. I would say they should just stick to doing what they’re good at, but that’s what got them here in the first place.